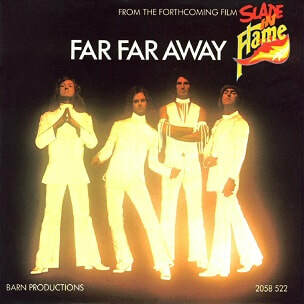 Far Far Away is Slade's first single from their fifth studio album/first soundtrack album Slade in Flame, in promotion of the upcoming film of the same name. Released by Polydor on 11 October 1974, it reached No. 2 in the UK and remained in the charts for six weeks. The single received a Silver certification from BPI in November 1974. The song was written by Noddy Holder and Jim Lea, and produced by Chas Chandler. By 1974, Slade had become a big success in the UK, Europe and beyond; however the band felt that continuing to provide 'more of the same' was not what they wanted to do. The band's manager Chas Chandler suggested Slade do a movie, to which the band agreed. Rather than producing a film portraying the band's "happy-go-lucky" image, the subject matter was based on the gritty tale of the rise and fall of a fictional 1960s group called Flame. To accompany the film, Holder and Lea began writing material for a soundtrack album, which would continue to see the band break out of their successful formula and try different musical ideas. "Far Far Away" was selected as the album's lead single and was released in October 1974, reaching No. 2 in the UK. "Far Far Away" originated with Holder. While on tour in America, he came up with the opening line while sitting on a balcony overlooking the Mississippi river in Memphis. Chandler urged him to go away and write the song immediately. Holder went to his hotel room and returned half an hour later having completed a basic version of the song, with the title "Letting Loose Around the World". Lea later further developed the song and, in particular, the chorus. In the band's 1984 biography Feel the Noize!, Lea recalled: ""Far Far Away" was a real collaboration between Nod and myself. The verse was Nod's and the chorus was mine. I wanted to record it like a barrelhouse song with a very airy feel for us but Chas wasn't keen." In a 1986 fan club interview, Dave Hill spoke of the song's lyrics: "The song was written about being abroad wasn't it? "Yellow lights go down the Mississippi" and all that - being in the States and wanting to go back home. They were just experiences. Obviously, when you are on the road, you are writing about being on the road, you're writing about what's going on." As referenced in Holder's biography, Far Far Away remains his favourite Slade song. In a late 1990s interview, Holder said: "the atmosphere, the feel of it, the melody and the lyric, it all sat into place. In a 1981 fan club interview, Don Powell also selected the song as one of his favourites. "Far Far Away" was released on 7" vinyl by Polydor Records in the UK, Ireland, across Europe, Australia, New Zealand and the Philippines. The B-side, "O.K. Yesterday Was Yesterday", would appear as an album track on Slade in Flame. Later in 1975, a 7" flexi-disc was released in the UK by Smiths Crisps as part of their "Chart Busters" series. "Far Far Away" was the A-side, with "Thanks for the Memory (Wham Bam Thank You Mam)" as the B-side. In 1989, a re-issue of the single in the Netherlands was released by BR Music. It featured "How Does It Feel" as the B-side. In 1992, the song featured on the Soundtrack of the German film Go Trabi Go 2: Das war der Wilde Osten and in the following year the fashion label C&A produced a TV advertisement ("Don Quixote") which used the song. Following the rising popularity of the advert, "Far Far Away" was re-released in Germany that year on 7" and CD formats. It reached No. 19 on the German Singles Chart. In Germany, the band performed the song on the TV show Disco. The band also performed the song on the Dutch AVRO TV show TopPop. A music video was filmed to promote the single, which was filmed by the same film crew the band were working with for the filming of Flame. Lea later recalled the video would have been directed by either Gavrik Lasey or Richard Loncraine. The video features the band performing the song while wearing their "Flame" outfits. In certain shots, camera tricks are used for a kaleidoscope of the band's faces. Record Mirror stated: "Want a surprise? Then listen to this Slade single which is taken from the forthcoming film Flame. This is a very melodic Noddy, no screaming or shouting - practically gentle by Slade standards, but it's very good, strong chorus line and backing. Just the name Slade normally means an instant hit, in this case, it'll be a well deserved hit." In the Record Mirror polls of early 1975, "Far Far Away" was voted No. 1 in the Top Single poll. Dave Lewis of Acton Gazette wrote: "No matter what you may think about Slade musically, you've got to admit they're not afraid to try something new on their singles. This latest one is an easy, mid-paced ballad with Noddy crooning to the rhythm of strumming guitars and once again there's a magnetic, singalong chorus." Daily Mirror stated: "Now for something completely different from Slade. No jolly romps, but Noddy doing a moody, slow and strong. From Slade's new film Flame. Big 'un." Thanet Times wrote: "By far, far and away the best thing to come from Slade this year. It could be the one to pull back some of their diminished support." Pete Butterfield of the Reading Evening Post commented: "A smoother Slade if you can imagine that, and I'm not sure whether I like it or not. I preferred them when they were boot boys, I think." In a review of Slade in Flame, Rosemary Horride of Disc said: "Side two opens with "Far Far Away", to my mind one of their more classy hits." In a retrospective review of Slade in Flame, Classic Rock said: "The band were still capable of being loud and yobbish, of course, but the wistful maturity of the album's singles - "How Does It Feel" and "Far Far Away" - began to show evidence of a new versatility." In 1993, the electronic band Red 2 recorded a cover of the song and released it as a single in Germany and Belgium. In 1995, Czech metal band Arakain recorded a version, "Dal Dal Se Ptej", for their album Legendy. In 1996, the reformed version of glam rock band Mud performed the track live. In 1999, Denmark band Pretty Maids recorded a version for their album First Cuts... and Then Some. In 2006, Denmark band Fenders recorded a cover of the song on their album It's Magic - hits fra 70'erne. In 2012, the song was covered and translated to Ukrainian by singer-songwriter Yuriy Veres for his 2012 album 60/70. In 2012, The Wonder Stuff covered the song on a disc of cover versions called From the Midlands with Love that accompanied their Oh No It's... The Wonder Stuff CD.